Slate Belt Mighty Mopars | Meeting for all things Chrysler since 1990. IMPORTANT NOTICE – SEE PRESIDENT’S PAGE FOR THE LATEST UPDATES!!! Welcome 2019! The Club plans are underway for two shows this year. The first show will be our 30th ANNUAL ALL MOPAR FATHER’S DAY CAR & TRUCK SHOW, held on Father’s Day, June 16th and our ALL MAKES CAR, TRUCK, & MOTORCYCLE SHOW held on Sunday, July 28th. Both of these shows are at Reagle Dodge. First, I would like to take this opportunity to thank all of our members who have actively taken part in the club’s activities by attending our monthly business meetings and the preparation and work necessary to successfully “pull off” our two car shows. This is a core of deeply dedicated women and men who give their time so freely! Third, for which there would be none of the above, those faithful and dependable individuals who attend our two shows with their vehicles! Please visit the “From the President” page (left side drop down menu) to read the latest on the club’s activities. 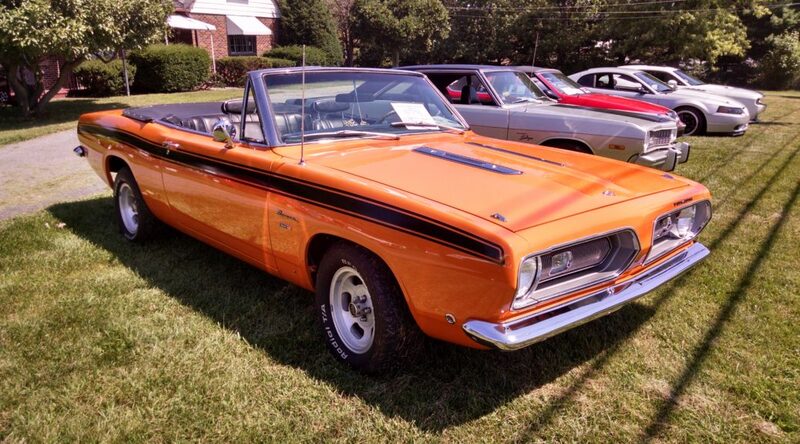 The featured car is long time club member, Erik Conrad’s, 1968 Plymouth Barracuda convertible. Erik’s car started life with a 318 and an automatic transmission. When he purchased it, it had a 273 and a 4 speed manual transmission. For many months it received a ground up restoration, and now sports a 416 stroker with the 4 speed and pushes out approximately 500 hp.. It’s the kind of fish you’d like to hook into any day! Thanks for sharing your car, Erik! To have your car featured, please email a photo of your car to the club President. The Club’s monthly business meetings are held the second Wednesday of every month at 7:00PM. Unless otherwise noted, October through April, the meetings are held in the Reagle Dodge dealership’s showroom and weather permitting, May through September, at Reagle Dodge’s outdoor pavilion. The Slate Belt Mighty Mopar Car Club was established in 1990 for those interested in all ChryslerCorporation cars and trucks, and to promote the Chrysler marquee. We are an open and family-friendly group, open to anyone with Mopar enthusiasm and owner. We have various shows throughout the year, and we are dedicated to original, restored, and modified vehicles. Our hobby and club is, by its very nature, a never ending exchange of ideas and information. This is an essential part of the mission of the club is to help foster that exchange. We have made available information about our club membership (note: PDF download). If you have questions about the club, including membership, contact our club president, Rick; for website and technical inquiries, please contact the webmaster. Meeting for all things Chrysler since 1990.